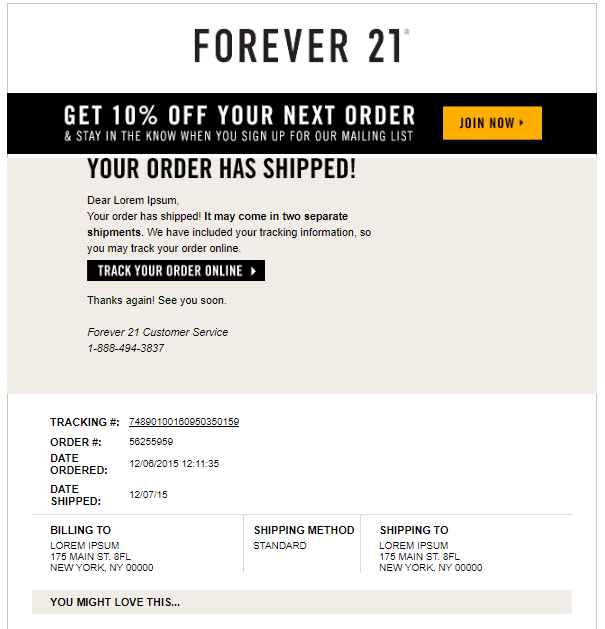 Be honest: are you treating your order confirmation emails as an afterthought? If so, you aren’t alone. Because there are more pressing messages for marketers to focus on, right? Think again. Order confirmation emails are arguably one of the most important messages in the world of ecommerce. How so? Keep in mind that confirmation emails receive 8x the opens of a traditional marketing message. And so while your customers might be sleeping on some of your emails right now, your confirmation messages a prime time to catch your customers’ attention. Such messages are also a key aspect of customer retention. Considering that it costs at least five times as much to acquire a new customer than it does to retain an old one, anything you can do to keep your current buyers in your funnel is a major plus. With all of this in mind, it’s clear why confirmation messages deserve your undivided attention. Confirmation emails are all about capitalizing on your customers’ momentum. They’ve made that ever-so-important purchase. Thankfully, brands have no shortage of options when it comes to those precious next steps. Want to hype something else in your catalog? Grow your social following? Totally up to you. 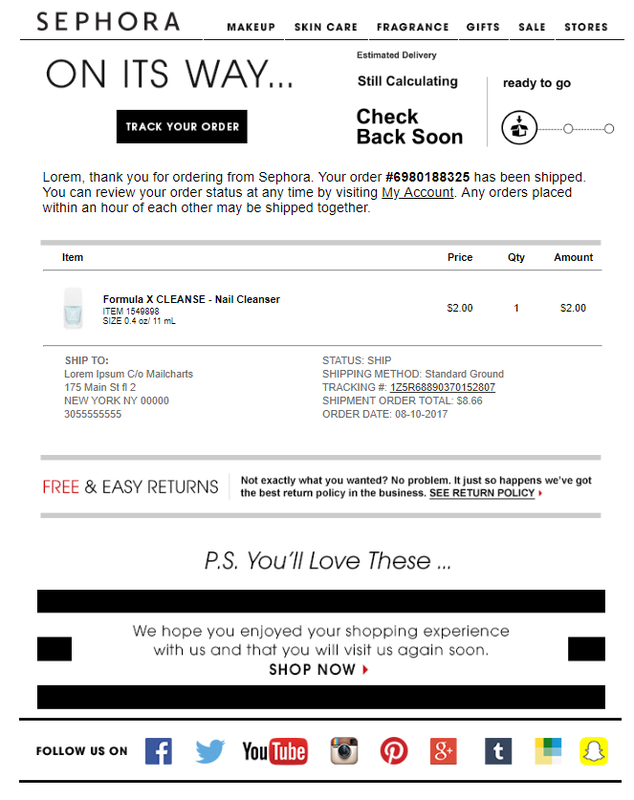 No matter what you might be selling, here are eight strategies that can instantly boost engagement and potential revenue from your order confirmation emails. Although confirmation emails are indeed autoresponders, they certainly shouldn’t feel robotic. Unfortunately, that’s exactly how many brands treat them. We live in a world where consumers crave personal and emotional connections with the brands they support. A bland, one-size-fits-all autoresponder doesn’t exactly scream “personal touch,” does it? At the same time, it’s not as if you can tailor each and every confirmation email beyond populated fields (name, order number and so on). So how do you find a happy medium? For confirmation emails, brands should look for ways to let their personality shine through imagery and copy. More specifically, a distinct brand voice. This example from Boden does a brilliant job of showing off their personality from top to bottom. The playful tone of the “New clothes incoming” tagline starts things off on a positive note. The notion of “holding onto” the email is also clever, treating the transaction as something that happened in-person. Other subtle touches such as consistently using “we” and “you” makes the message seem more conversational. This continues throughout the rest of the message including some creative calls-to-actions (“This Way” and “Spill the Beans”) which are in line with Boden’s brand voice. This confirmation email from Polaroid is a straightforward autoresponder but likewise includes some small personal touches that make it effective. The “We’re on it” tagline signals that the company is paying attention. Coupled with conversational, reassuring copy, the message manages to address all of the buyer’s potential concerns. And of course, the featured image is distinctly Polaroid. Again, getting personal doesn’t have to mean reinventing the wheel. Followed up by more light-hearted, humorous copy (“Are you smiling? You’re totally smiling”), the message keeps the personal notes above the fold before getting down to business with confirmation details. These small personal elements may not seem “make-or-break,” but they can certainly add to a confirmation series that’s otherwise lacking a voice. Order confirmation emails can be a potential goldmine of additional transactions, granted you don’t push too hard for that follow-up sale. Perhaps one of the best ways to encourage repeat business is by offering up recommendations. Consider that recommendations account for 31% of e-commerce revenue, not to mention significant upticks in return customers, conversions and order value. Ecommerce giants like Amazon have proven time and time again the power of recommendations. Of course, technical know-how and having a platform for offering recommendations is what holds many smaller brands back. The good news? You don’t necessarily need a full-blown recommendation engine to propose another purchase. Instead, simply link to best sellers or featured products and link to them in your order confirmation autoresponders. 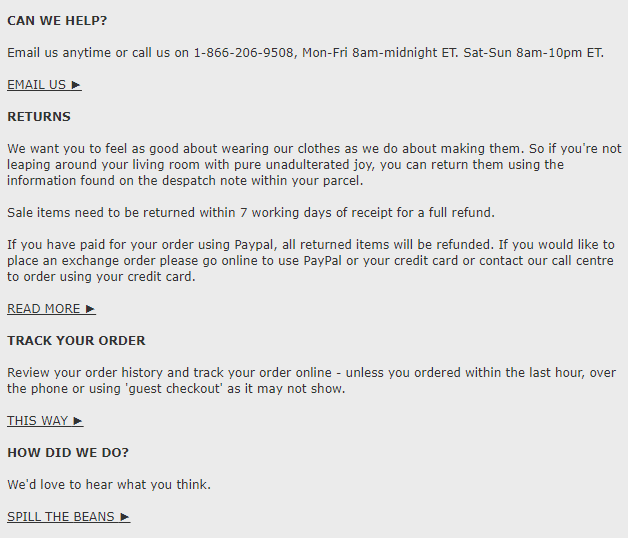 That’s exactly what West Elm does to sweeten their order messages. This not only makes the email feel more tailored and personalized but also encourages another transaction right then and there. Highlighting best sellers serves as a proof that you already have satisfied customers and your products are in demand. If you aren’t already digging into your data to identify best sellers, maybe now’s the time. 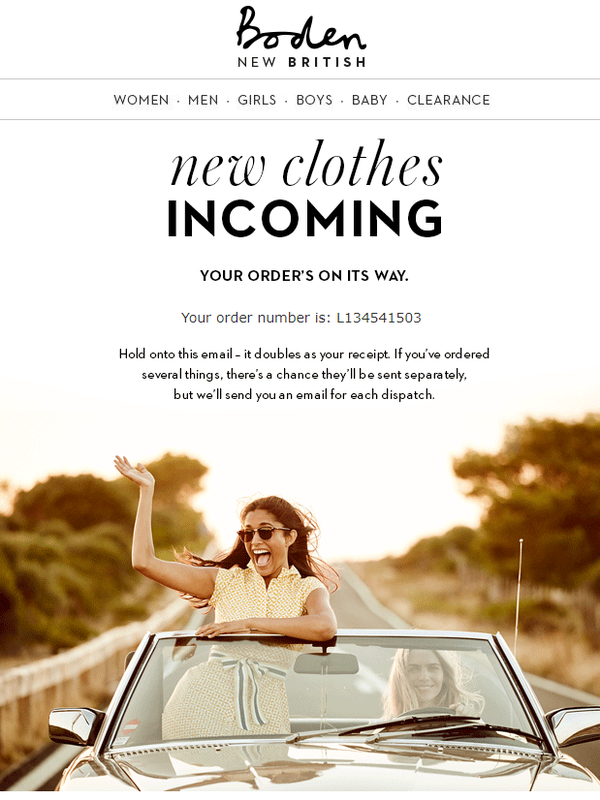 Order confirmations might feel like they’re “for-your-eyes-only” messages, but they can also bring new shoppers into the fold. Providing a referral code or discount does double duty of enticing repeat business and introducing your products to a totally new audience. 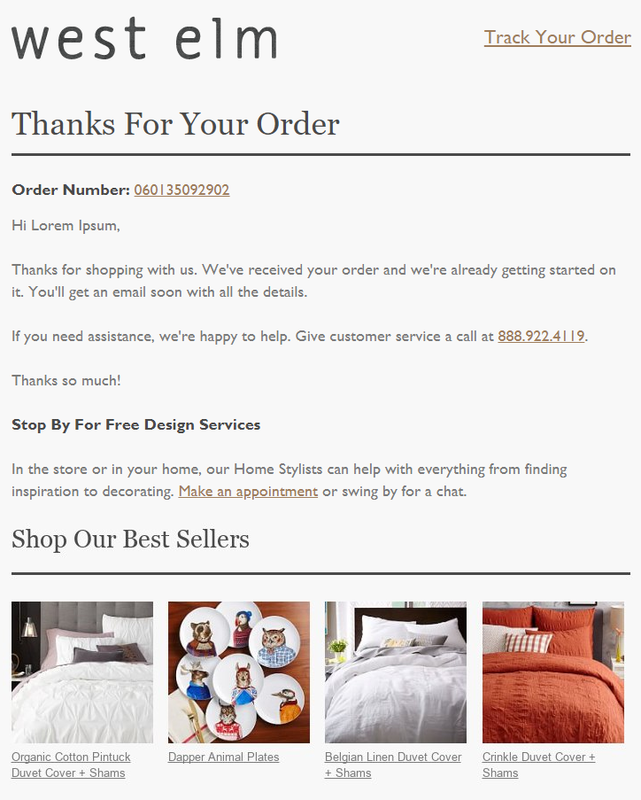 For example, Brooklinen drops a brief referral promo in their emails to encourage sharing among friends. Based on the best practices, you can tack on a referral pretty much anywhere throughout a confirmation email without interrupting your readers. And if you’re on the fence about including a referral or feel that it’s too spammy, think again. A digital word of mouth is as powerful as ever, with referral customers boasting a 16% higher lifetime value than non-referrals. In short, referral offers are win-wins as you create brand advocates and squeeze more out of your order confirmations at the same time. Not unlike referrals, offers and discounts in order confirmations can feel like a sort of reward to shoppers when presented tactfully. This discount from Forever21 is fairly straightforward by offering up 10% off a future purchase. This sort of discount obviously isn’t going to break the bank, but may very well be the incentive someone needs to check out your store again. Of course, deals come in many shapes and sizes. This order confirmation from Ruelala offers a future discount in the form of free shipping. A smart move given that free shipping is more or less an expectation of many shoppers (thanks a lot, Amazon), note also how their offer is front-and-center. 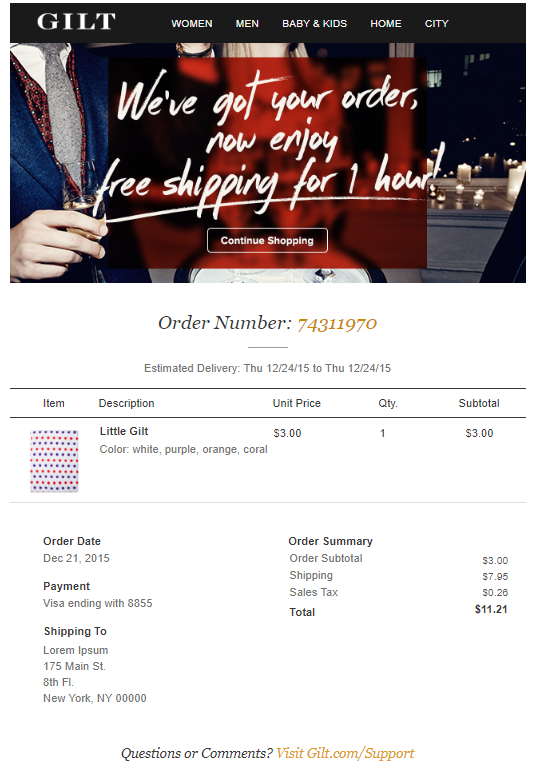 Here’s another free shipping discount, this time from Gilt. This time-sensitive offer is rather bold, especially since it only lasts for one hour. That said, creating a sense of urgency obviously encourages shoppers to act sooner rather than later. Offering such deals is also a prime option for those who are wary of offering discounts to new customers. Rather than worry about devaluing your product, these offers reward your current customers only. Sure, email subscribers are awesome. But email subscribers and social followers? Because encouraging both means that you have multiple touch-points to get your marketing message across to customers. You don’t need much real estate in your emails to boost your social presence via email, either. This confirmation from Sephora points to all of their social icons in a way that’s can’t-miss thanks to the contrasting colors. You can likewise tailor your social buttons based on whichever networks are your top priority. Dollar Shave Club takes their social game to the next level by offering a place for buyers to share their latest purchase. Coupled with a referral code, shoppers have even more incentive to smash the share button. 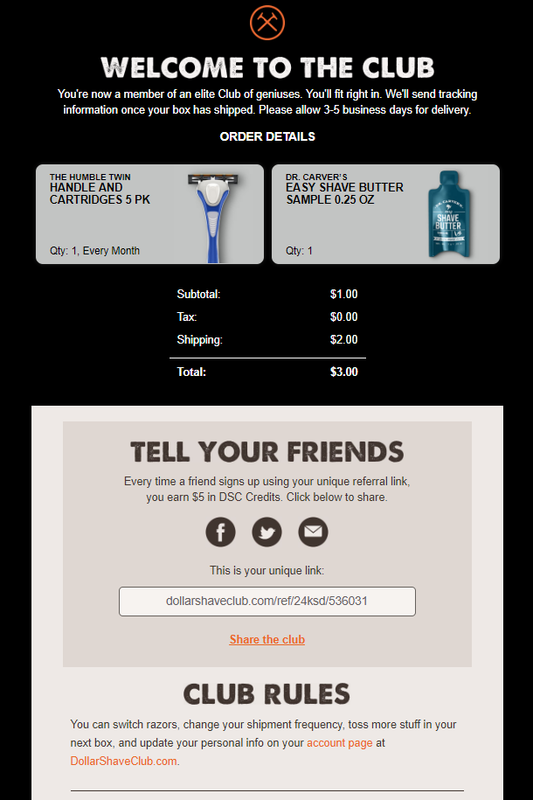 Dollar Shave Club and their email marketing at large focus heavily on the concept of community. Similarly, brands promoting their social channels should consider promoting their social following similarly. Think about it. You’re trying to build a community of customers via social, right? Beyond listening handles and hashtags, you can also take the time to mention why people should follow your accounts. Whether it’s exclusive content or social discounts, providing a concrete reason can score you more followers. There’s no doubt that the public at large is more comfortable than ever with the concept of online shopping. That said, they have every right to be skeptical about shipping or the specifics of their order. This is especially true if they’re first-time buyers who aren’t 100% familiar with your brand. Besides, they’ve probably been burned in the past by another brand. This is your opportunity to prove that you’re not going to do the same. That’s why it pays to be crystal clear about shipping and how buyers can keep track of their orders. You should also highlight customer support channels including email, social media, and a good old-fashioned phone number. 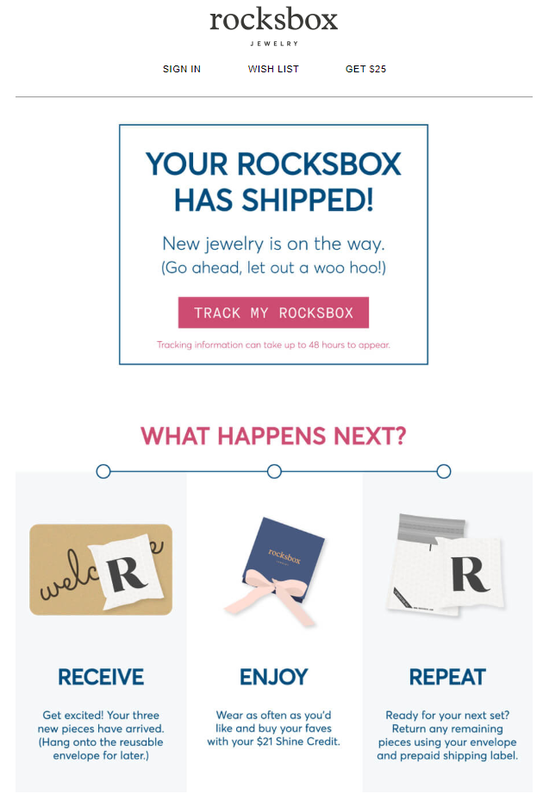 Rocksbox does a great job of conveying expectations for new buyers. Mapping out exactly what happens next and providing a tracking code, buyers don’t have to second-guess the status of their order. This sort of transparency and communication puts you in a positive light with your buyers. Rather than try to compete with the likes of Amazon with next-day shipping, simply provide realistic expectations and frame that your order will come as soon as it can. Looking to give your customers the VIP treatment? Your confirmation emails are one of the best places to make it happen. 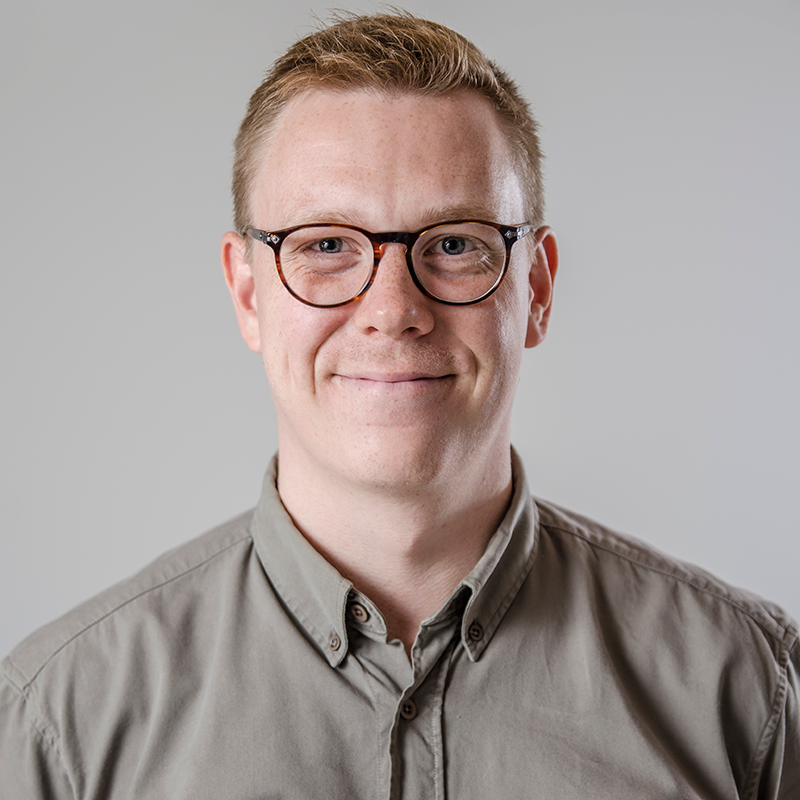 As is the common thread with shoppers taking next steps, providing a concrete reason is going to encourage clicks versus being vague. 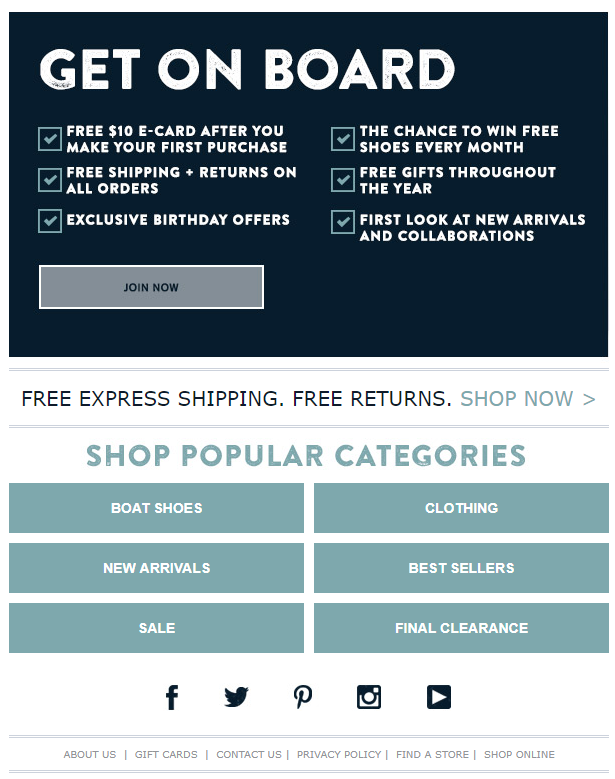 Here Sperry outlines a laundry list of benefits for joining their loyalty program including freebies and exclusives. 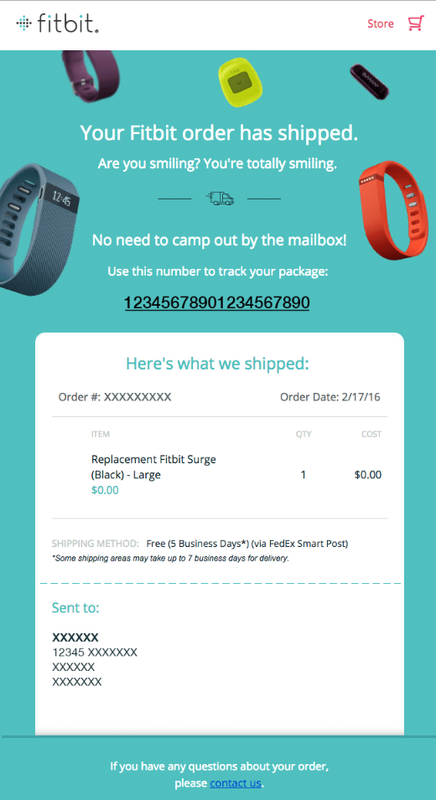 If you haven’t revved up your loyalty program, look at your order confirmation emails as a starting point. They’re a great opportunity to segment your email list and reward your most eager buyers through exclusive deals. Oh, and don’t forget that consumers spend 37% more with brands they’re a member of a loyalty program with. Loyalty programs are another important aspect of customer retention. The offers and discounts you hype now will ultimately result in squeezing more out of your subscribers in the long run. Last but not least, let’s talk about the power of user-generated content (UGC). Customer photos. Testimonials. Social snapshots. All of these elements are proven trust-builders that create a strong sense of authenticity. They’re also a double whammy for promoting your social channels or hashtags, much like Man Repeller features their Instagram feed in their emails. You could use UGC to promote hashtag contests and featured customers on your Facebook or Instagram. This encourages social sharing, more UGC and, most importantly, more sales. In other words, an ecosystem of shopping and sharing. With that, we wrap up our list! Are You Making the Most of Your Confirmation Messages? 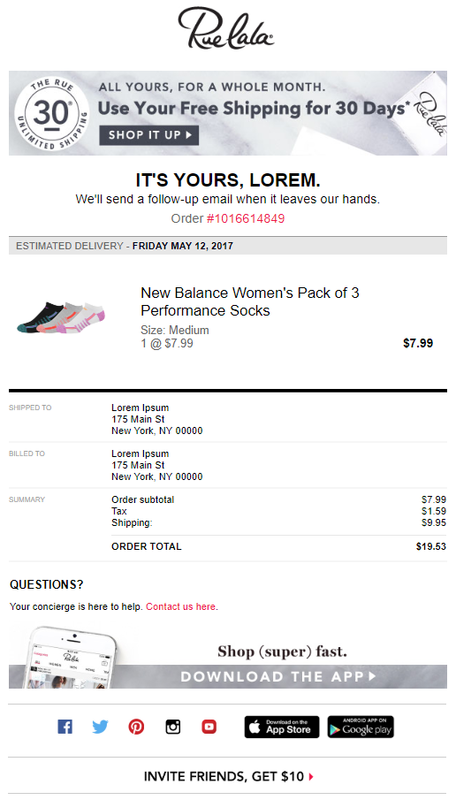 At a glance, order confirmation messages might not seem like much. But they can pack some serious marketing firepower when you think about them in terms of your big-picture goals. The final takeaway here is that you should offer some sort of call-to-action following your purchase. Because if someone buys something from you once, they already trust you. It’s about encouraging them to do it again. 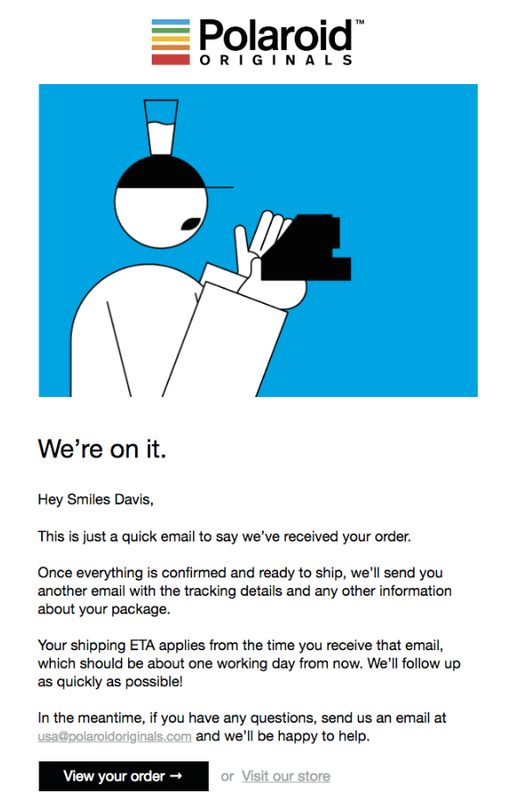 Setting the initial tone with an order confirmation is the perfect way to do it. And so any combination of these tips is fair game as long as you’re driving shoppers to take action.